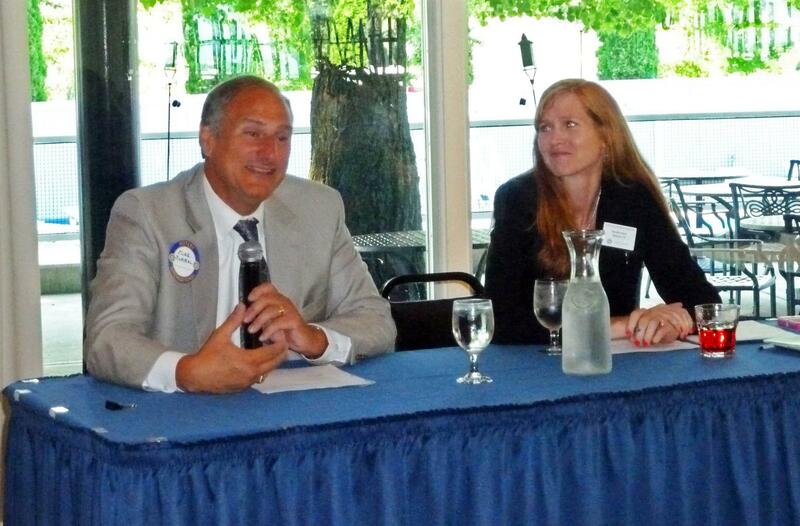 Today our guests were Mike Rummel and Sandra Hart, the Lake County Board representatives for Districts 12 and 13. They made an adroit "tag team" in telling us about their roles on the County Board - and why the County matters to all of us. Mike opened by asking how many people own property in Lake County ... use the bathroom ... have ever been bitten by a mosquito ... These questions elicited laughs, but Mike explained that via the County Stormwater Management, Sanitary District, Mosquito Abatement District, and more, County government is directly related to everyone's daily life. Sandy explained that 7% of our property tax bill goes to Lake County, with another 3% going to the Forest Preserve District (under the aegis of the County Board). She talked about recent changes in how property assessment review is done and encouraged residents to contact her with any questions. Mike told of a new law passed by the Illinois legislature that targets specifically Lake County, requiring that a five-member, paid Election Commission be established to oversee elections, effectively taking this responsibility out of the hands of the County Clerk. With a projected cost to the taxpayers of up to $1 million a year, the County Board is looking for ways to block the change. Mike and Sandy both talked about touring the county jail and what they learned about problems there. Many prisoners are more properly categorized as mentally ill than criminal, and there is currently a long delay in their receiving needed medications after their release. This is one of the areas where the board members are trying to make changes. Sandy is also working with a group trying to bring paratransit for the disabled to Shields Township, and Mike is working on getting a bridge over the railroad tracks at the south end of Middle Fork Savannah to allow access from the south. The two board members covered many other topics in their talk as well. We are grateful that they took time from their obviously busy schedules to make us better informed this morning!